Connected Leadership and Learning: We Cannot Do It Alone! This picture is from one of our Spotlight School visits. Howe was select last year (and this upcoming year) to host other schools and share best practices. The person on the left is Scott Kellogg. He is our grant coordinator. Scott is also the former principal at Howe. When he retired, I took over. The person on the right is Val Tonn. She is one of my art teachers, and she also helped coordinate our grant efforts. Val is a prospective administrator. She just received her principal license. This image is a visual example of what it means to me to be a connected leader and learner. Everyone has something to offer for each other. 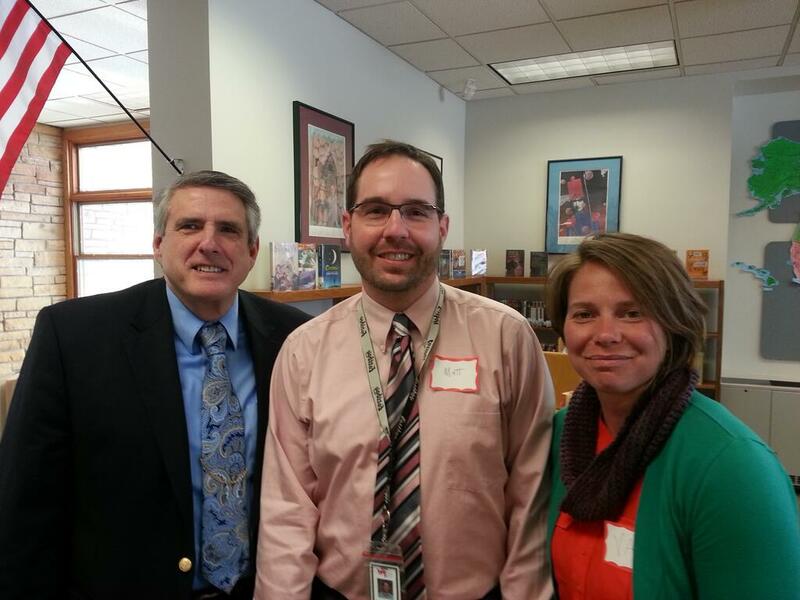 Scott is a wellspring of knowledge and experience regarding the principalship. If I ever have a question, he usually has a ready response. I have made far fewer mistakes due to our candid conversations. Val has a lot of spirit and new ideas with regard to what leadership can be in the schoolhouse. If I am ever feeling a little worn down, she can lift my spirits, as her enthusiasm is contagious. Who do you choose to surround yourself with? Do they enhance your intelligence, and infuse more passion into your position as a learner and leader? What do you have that you can offer to others? Great post, Matt. I just took on the role of elementary principal and will appreciate your continued insights. It is so great to be living in a time when we can “surround” ourselves with mentors and friends both near. Previous Previous post: Why Should Educators Blog?